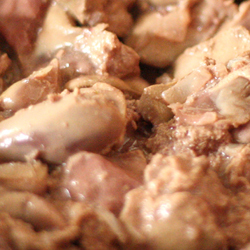 Put the chicken livers into a bowl, add the milk and stir to mix. Cover and place into the fridge for ½ hour. Drain the livers and discard the milk. Rinse the livers in cold water and pat dry with kitchen paper. Melt a third of the butter in a frying pan, add the spring onions and cook for 2 - 3 minutes, do not brown. Add the livers and cook over a medium heat for 4 - 5 minutes or until just cooked. Remove from the heat and allow to cool. Transfer the livers to a food processor and process until smooth. Chop the remaining butter, add to the processor with the Grand Marnier and orange juice concentrate and process until creamy. Season to taste with salt and pepper. Transfer the pate mixture to a 1.25litre / 44floz serving dish or terrine, cover the pate surface with cling film and chill until firm. For the jellied layer: whisk together the orange juice concentrate, Grand Marnier and 125ml / 4floz of the chicken consommÃ© in a jug. Sprinkle the gelatine over the liquid in an even layer and leave until the gelatine is spongy - do not stir! Heat the remaining consommÃ© in a pan, remove from the heat and add the gelatine mixture, stir to dissolve, and then leave to cool and thicken to the consistency of uncooked egg white, but not set. Remove the cling film from the pate and press the orange slices lightly onto the surface, then spoon the thickened jelly evenly over the top. Refrigerate until set. Serve the pate at room temperature with toast or crackers.